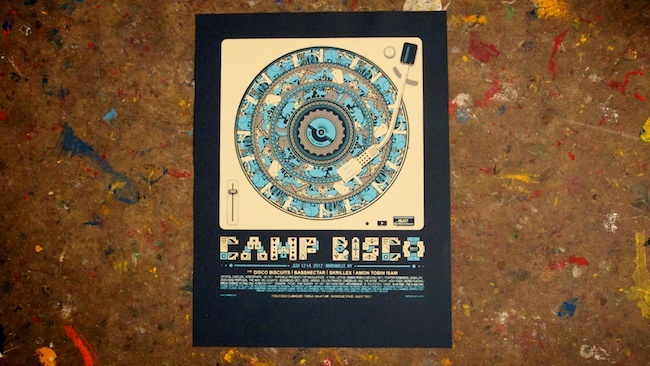 Check out this awesome 2-color print for The Disco Biscuits 2012 installment of Camp Bisco. Every year The Disco Biscuits put together and eclectic mix of awesome acts to play all day and night for a few days. Acts have included everyone from LCD Soundsystem to Brothers Past. This awesome 19"X25" print was screened on French Paper nightshift blue cover stock. I wish I could see the biscuits at mayan holidaze right now. Its been a while since ive seen them and they always put on a show. Great post keep up the hard work. Check these out IStillGotMyGuitar.